The shank of most router tool bits are totally cylindrical. Typically, they are exposed to high feed rates, especially on hand held routers. In order for a chuck to keep them from slipping, it has to exert a tremendous amount of force on the shank of the tool without damaging it in any way. So, a chuck designed for use on a router has many stringent requirements that are difficult to achieve. For example, it must have a substantial mechanical advantage, be small in size, mount directly to the router spindle, be balanced, rotate concentrically, use quality materials, be manufactured and tested individually, and last but not least, be easy to use. Make no mistake about it, deviation from any one of these requirements could cause serious problems. So, a very high standard of quality control must be maintained for each and every chuck. We are confident that the "Musclechuck™" assembly more than satisfies all of these difficult requirements and will afford the user many years of trouble free operation. See magazine articles. There are several ways to be able to clamp onto a totally cylindrical tool shank that doesn't contain flats or any other modifications with adequate force to keep it from slipping. For example, some of these methods are; a simple radial set screw, a standard three fingered drill chuck, a typical collet arrangement, an offset cam, and effectively a noose. Each method has its good and bad points. Some do not have or need the clamping force required for this application, as in the case of a standard drill chuck or a simple radial set screw. These two methods are typically not used in a router application. Some have adequate clamping force but can indent or damage the tool shank (see figure 1) if it is over tightened, as in the case of a cam chuck. Some configurations cause instability when they extend the tool far from the end of the router spindle. For example, an extension chuck which is mounted in the standard collet and not to the actual router spindle. This can cause considerable vibration thereby not allowing it's use on a hand held router. Some are cumbersome to use when a tool bit has to be changed, as in the case of a standard collet. 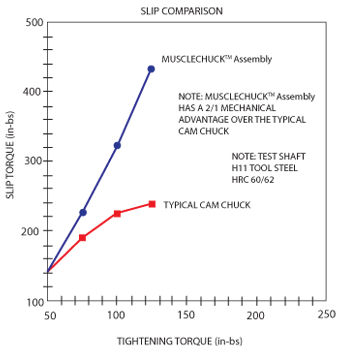 However, the "Musclechuck™" assembly forms a noose around the tool shank and because of it's relatively high mechanical advantage can apply a tremendous amount of force (See Graph) to the tool shank without damaging it. This enables it to stabilize, clamp, and spin larger diameter cutters more safely and without any slippage. It's extremely easy to use because the cutter can be changed in a matter of seconds by simply using a "T" handled hex wrench. With our setting rings, multiple depths can be preset on different cutters to save even more time. 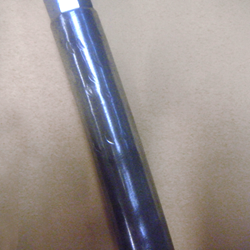 Also available are reducing bushings in both inch and metric sizes for several different shank diameters. The "Musclechuck™" assembly is far superior to a cam operated chuck because it has no cam. A cam is another part that can wear out or be damaged. For example, a cam can distort due to over tightening of the cap screw causing damage to the tool shank (see figure 1) and/or not release the tool shank. When the screw is tightened on the "Musclechuck™" assembly, the split head of the chuck distorts ever so slightly thereby firmly securing the cutter circumfirentially. So, less parts in any assembly equates to less components that can wear out or malfunction. Other quality features of the "Musclechuck™" assembly include the use of heat treated aircraft grade chrome-moly steel, an electroless nickel coating that is applied to military standards to prevent corrosion, and the highest quality aircraft grade certified cap screw on the market.